Happy Mother’s Day! For a change of pace, I planned an acoustic ‘unplugged’ set to lead our worship experience this week. 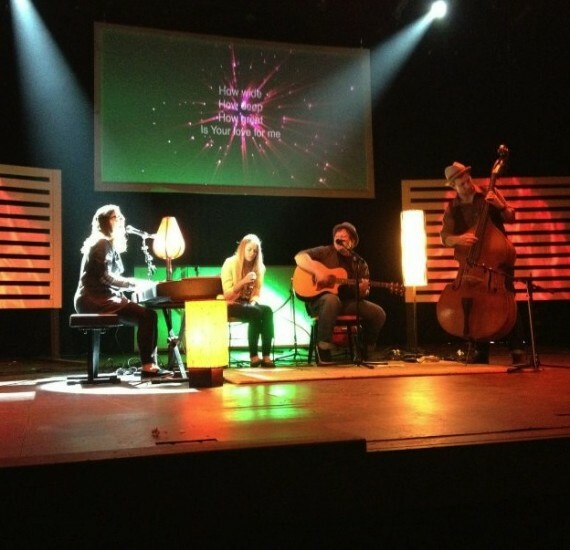 We threw down a cool rug, brought in some vibey lamps and busted out the upright bass….it was freakin’ cool! Top that off with great players and some killer vocals….the set was choc-full of musical moments. It was interesting and challenging to play without a percussion instrument, but it forced us to lean into the uniqueness of each instrument in the band. The upright bass didn’t have electronic pick-ups so we had to mic it. I think if we’d had percussion it would have overpowered the mic, so that was a bit unexpected good fortune. As if it wasn’t enough to just lead worship with this fun band set-up, the highlight of the morning was a thematic song we did featuring one of our stellar singers. So this would be the perfect time for me to introduce you to Helene Immel. She’s a singer/songwriter, artist and worshipper of Jesus. Do yourself a favor and get to know her music. Here is our version of How He Loves. Here is the video of Helene singing Aftermath…you are welcome! What did you think of the songs/performance?